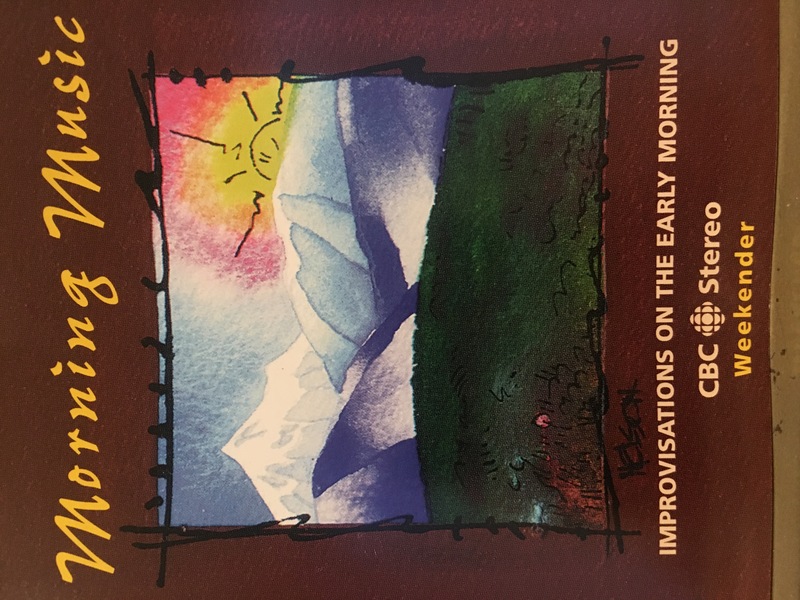 The CBC released a CD called Morning Music, which features 14 tracks by composer/performers such as Glenn Buhr, Stephan Bauer, Matthieu Keijser and others. Included on the disc are four pieces I created for the show. Unfortunately the CD is no longer available, but an example from it is my piece Good Morning Varanasi. The music was created in one take, with no overdubbing, using harmonium, temple bowls, gongs and tabla. 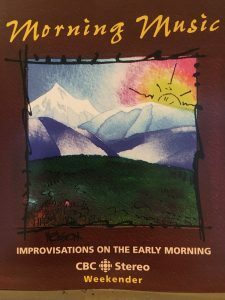 During 1990/91 I was part of an inventive ensemble called Solana, led by the multi-instrumentalist and composer Shelly Berger. Other members of the group were guitarist Brian Katz, bassist George Koller, pianist John Goldsmith and saxophonist Albert Von Seggern. Shelly wanted to avoid cliché drumset sounds in the music, so I used instruments like tabla, bodhran, African hand drums and, often, a set-up with half a dozen suspended cymbals. We made one CD, also titled Solana, which is still available. The first track on the CD is a piece co-composed by Berger and Von Seggern called A Dance in Green. I used an African frame drum and suspended cymbals. The following track is Brian Katz’s piece In The Woods Kids, and is an example of the cymbals-only approach. In the early 1990s I did several projects with a very creative Canadian violinist and composer – the late Oliver Schroer (1956 – 2008). Although based in traditional fiddling styles, Oliver’s music is often highly complex, and usually fuses genres from around the world. The following two tracks are from his 1993 CD Whirled. This CD is hard to find, but is still available. On Blue Sun in a Yellow Sky I played marimba, with the virtuoso South Indian drummer Trichy Sankaran on kanjira. Pat Hutchinson plays the Uilleann pipes, Pat O’Gorman plays flute, and Mark Duggan is on shaker. On The Humours of Plato I played drumset. Dave Woodhead was on bass and Carlos del Junco played harmonica. I believe this was the last time I played kit on a recording; however, I still have my beautiful Gretsch be-bop set, which is what is heard on this CD. Oliver’s piece could be played fusion-style with a full complement of toms, but he wanted a simpler and more transparent approach. A great jazz drummer and fellow Eastman alum, Roy McCurdy, often came to gigs with only a snare, bass, hi-hat and ride cymbal. His opinion was if you can’t make it happen with that, then adding more gear isn’t going to help.